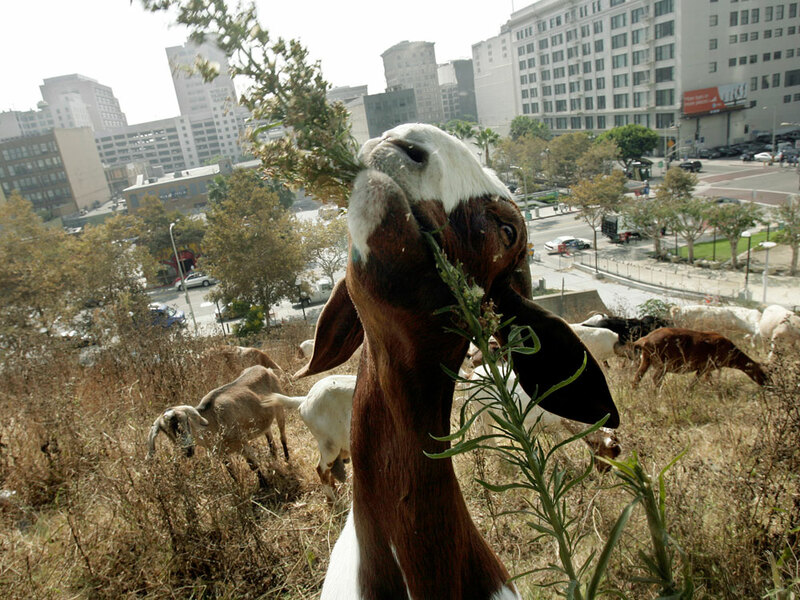 In connection to our recent posts on emergent and constructed forests, NPR just ran a brief story on the annual return of goats to Bunker Hill in downtown Los Angeles. For the past three years the goats have been brought to the stepply-sploed site to level the weedy forest that self generates on Angel’s Knoll. 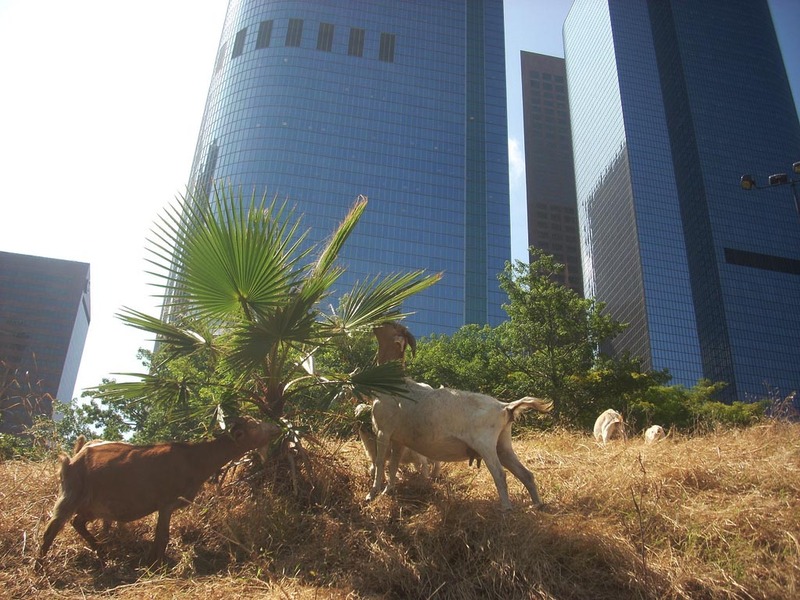 As the LA times reported earlier, the goats take about two weeks to eat the landscape down to the ground, with the free vegetative fodder supporting 100 of the living levelers. During that time LA’s citizenry comes in contact with a very different take on urban ecology. Even with a shepherd and private security, the goat team cost less than half what it would cost the city to bring in a more typical petro-powered mechanized crew. Wired produced a short film on urban goats back in 2008, observing that the animals were already being employed to control unwanted vegetation in at least 15 U.S. states. The trend appears to be gaining momentum and many cities can now rent goats from private contractors to tame emergent forests, particularly for steep and hard to reach locations, such as highway embankments. But could this urban ecology be taken a little further and made a bit more systemic? 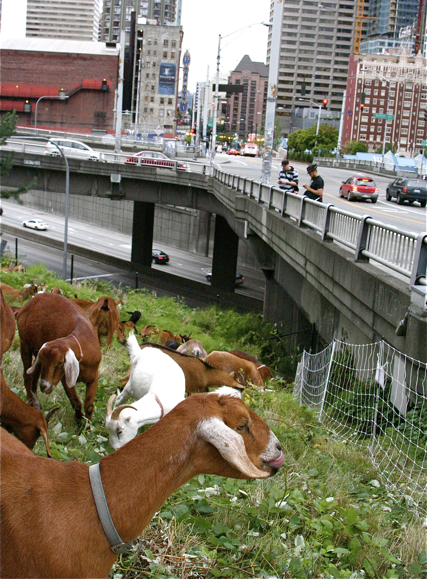 Beyond the isolated, trucked-in insertion of goats, could a city support a continuously roving herd of weed levelers and their attendant shepherds? 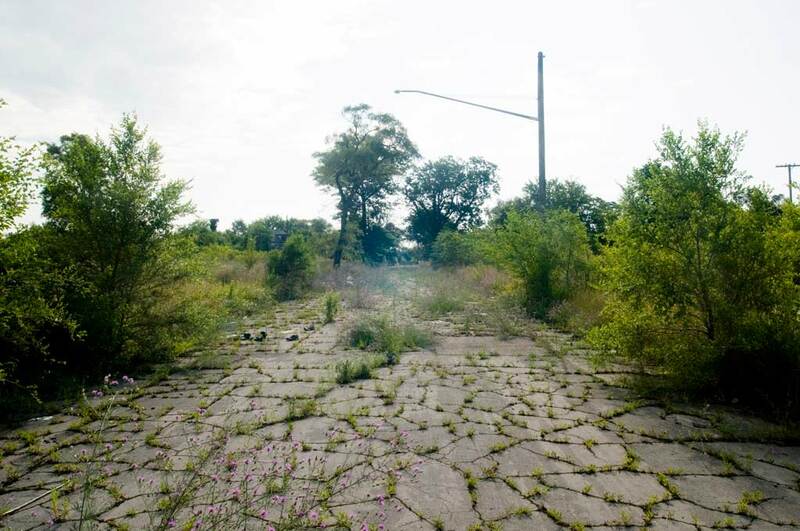 A living infrastructure that traverses the city from one feral urban prairie to another? A biotic replacement for the constant hum of lawnmowers and annoying leaf blowers? A new breed of appropriately anachronistic, post peak-oil nomadic freegan shepherds guided by open-source iphone urban agrarian apps. as they migrate through the city with their loppy-eared flock in tow, nutrifying disused urban prairies whist procuring milk and a bit of cashmere? The numbers and sustainability of such cunning opportunists would vary depending on the natures of each city – the more feral and shrinking the better. Goats rather than sheep, cows, alpacas, or llamas because goats are less picky and can thrive on a far more impressive range of undesirable fodder – including poison oak and the thorny blackberry. 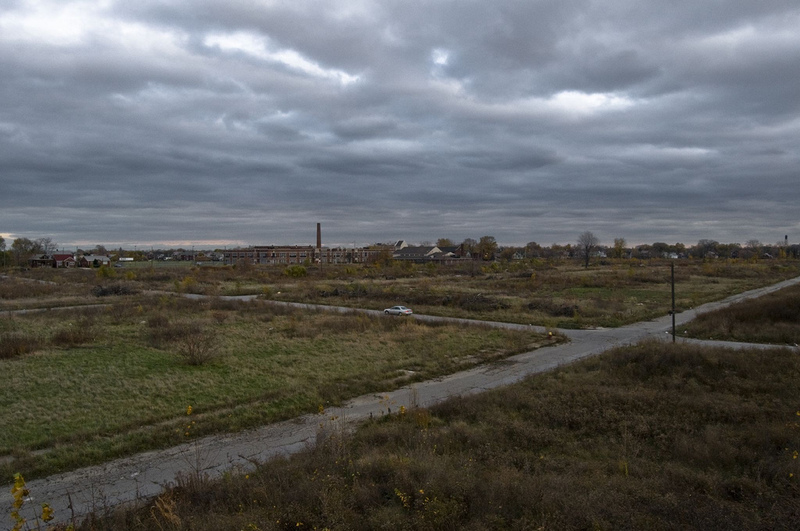 Youngstown and Detroit’s emergent urban fields could support a regenerative foundation of such semi-wild herds, assuming they can bear the cold winters and negotiate a respectful coexistence with the city’s packs of wild dogs. Perhaps a shepherding of a less institutionalized agricultural urbanism nearly worthy of a 2011 lo fi “Waits” award. That’s amazing! I wonder if the goats get paid minimum wage! or is their payment the food they eat?